Since the beginning of this project, I've been collecting all my studio floor sweepings in a box with the intent of creating a "swept floor" mosaic. This is an ironic nod to the Hellenistic tradition of the unswept floor mosaics, where the floor was mosaicked to look like it had the leavings of a banquet on it. 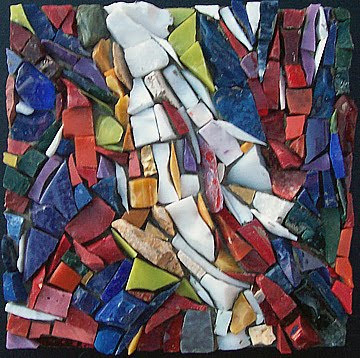 All the pieces in this mosaic literally came from off of my studio floor, and I cut as few of them as possible. There is still probably enough material in the box for several more of these. It was a very interesting exercise, and I'll probably do it again in another 50 or so mosaics.